We had arrived in Winchester, an hour's drive from London. This ancient and royal city of kings would be our first stop on a three week driving tour that would include Bath and Oxford with wonderful treats and sights en route. This is the first of a two part series. So come along for the ride and I hope that you enjoy it as much as we did. If there is anything that you would like to know, do contact me either by email at les@leslieback.co.za or leave a comment on the blog at http://www.leslieback.co.za. I would love to hear from you. And remember, that part two of this odyssey will follow soon. We stayed at The Wykeham Arms, an 18th century coaching inn. It is 250 years old. In English terms, not even old. They do harrumph about things that are ‘new’. The inn is tucked away in the quietest and oldest part of Winchester, sandwiched between Winchester Cathedral and Winchester College. When we were there, the Publican was Graeme Jameson. He had plucked the inn from relative obscurity in the 1980s and built up its fine reputation. Sadly he has subsequently passed away, but the inn continues to charm under its new proprietors. The pub was full of cricket memorabilia as Graeme adored cricket. He and my husband Eugene had many fireside chats, debating the finer points of this noble game. I remember that the accommodation at the inn was indeed ‘noble.’ We stayed in the Canon Room. After all, it is a cathedral town. We had the crispest white sheets, fluffiest white duvets, most luxurious white towels and steaming hot water. he fourteen rooms, each one different, were beautifully appointed and with different names. We had a tranquil view of trees, green grass and meadows and enjoyed the sight of horses with their riders clip clopping past the inn. Graeme’s wife and young daughter stopped there to collect carrots for their mounts. The breakfast room was upstairs and there we ate a quintessential English breakfast. Plump and juicy kippers and sausages bursting in their skins served with perfectly poached eggs with golden yolks. There were homemade preserves and mountains of crunchy toast. We didn’t dare talk too loudly. Everyone was concentrating on plates of delicious food. It was all taken very seriously. 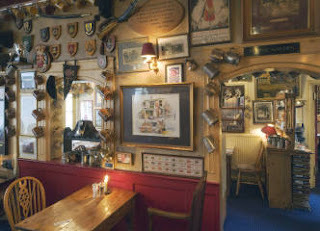 We loved the pub and restaurant food in the cosy bar downstairs, a bustling typically English pub that is known far and wide. Businessmen, lawyers from the nearby courts, clergymen, tourists and anybody wanting a traditional British meal. But we had not come to Winchester just to eat! Winchester has such a rich history. King Alfred the Great made it his capital. 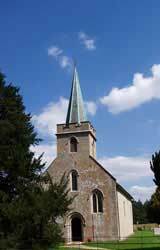 It is the burial place of many of England’s Kings, Queens, Saints and famous people such as Jane Austen, Izaak Walton and Keats. The rule of Common Law was established there, the Doomsday Book compiled and the Winchester Bible written. It was fascinating to see that the earliest recorded cat show took place in 1598 in Winchester. Hardly momentous, but as we adore cats, significant to us. 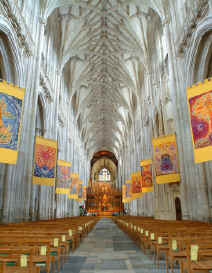 Our first visit was to Winchester Cathedral. It has been written about, spoken about and even sung about. A stone’s throw from The Wykeham Arms; it took us no time to walk there. Building began in 1079, I think that even the English would concede that the Winchester Cathedral is old. Much of the Cathedral had been altered since Norman times, but the crypt and transepts still stand. It remains one of the finest examples of Gothic perpendicular style to be found anywhere. There is always a special silence in these monumental cathedrals. The vast vaulted ceilings dwarfed us and we felt a little overawed. We found the grave of Jane Austen. There is also a stained glass window erected in her memory, acknowledging her reputation as a famed writer. We wandered for a long time, breathing in the vast age and beauty of the place. Jane Austen lived at Chawton in the historic and beautiful county of Hampshire in the south of England, 17 miles from Winchester from 1809 to 1817. Today Chawton is regarded as her literary home. While there, she revised ‘Sense and Sensibility’ as well as ‘Pride and Prejudice’, which she had written some years earlier. Later she wrote 'Mansfield Park', 'Emma' and 'Persuasion'. The house is now the Jane Austen Museum and is crammed with memorabilia and original manuscripts. There is a bookcase containing first editions of her novels. Constance Hill, in the preface to the first edition of her book, ‘Jane Austen, Her Homes and Her Friends’ notes that “her own family were so much and the rest of the world so little to Jane Austen.” It was in the centre of her family whilst living in Chawton that she was most happy. When late in 1816, Jane Austen became ill, she and her sister rented rooms at 8 College Street in Winchester to be near her physician. She did not recover and sadly died soon after on the 18th July 1817. The house in College Street is now a museum. Some countries boast about having the newest and glossiest of buildings. Not the English. They cherish their old and sometimes ancient landmarks. One morning, fortified by a superb English breakfast, we wandered past one of these venerable landmarks, Winchester College. Wykehamists (as those in the college are called) claim it is the oldest continuously running school in the country. The school’s motto, ‘Manners makyth man,’ is a saying of William of Wykeham, founder of the school. Interesting to find out how our lovely hostelry had arrived at its name. The words, ‘Wykehamist’ and Wykehamical ‘ have found their way into the Oxford English Dictionary. We came across another amazing treasure, King Arthur’s Round Table. Legend has it that Winchester was King Arthur’s Camelot. The Round Table is housed in the Great Hall, the only remaining part of Winchester Castle. Some say it is probably an ancient fake, I prefer to think not. 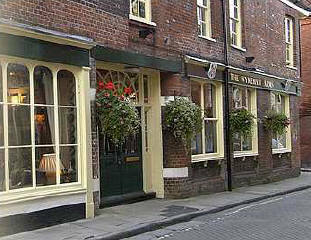 Every afternoon, pleasantly weary from our wanderings, we would return to the Wykeham Arms. Dinner at the Inn was always a delight, a different menu every evening listed on a blackboard. While sometimes we ate “bangers at the bar,” sausages to the uninitiated, dinner was always beautifully prepared and presented. Roast rack of lamb, tender and perfectly cooked; calves liver with garlic mash and red wine and onion gravy. Fish, delicately prepared and served with fresh, lightly cooked vegetables. Not a frozen vegetable in sight! All delicious, all beautiful. Who says the English can’t cook? We sat at old school desks, an echo of the Inn’s affinity with nearby Winchester College. Too soon it was time to move on. Our host gave us all sorts of assurances about our next stop. We were not at all certain about our next destination or even how to get there. We had heard so much about Glastonbury and had booked a room in an hotel, which was a converted monastery. It had seemed like a good idea at the time, but after the glorious comfort of our room at the inn, the thought of a converted monk’s cell was distinctly unappealing. Should we just go straight onto Bath? Graeme painstakingly marked our route on our road map. He said to phone him from Glastonbury and if we were not happy with our choice of hotel, he and his wife would consult their books and find an alternative. So sad to say goodbye to our new friends and to this lovely corner of England! We packed the car and left after breakfast. Oh the joys of an English breakfast! We took a leisurely drive along the A30. Thank heavens for Graeme’s carefully marked route. The beauty of the English countryside was balm for our souls. Suddenly I spotted a sign, Longleat. How wonderful! 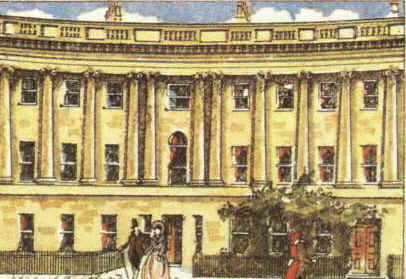 We had read about this stately home, the ancestral home of every Marquis of Bath for four hundred years. We followed the signs to Longleat House and were totally unprepared for the sight that awaited us. It is said that the approach through lush parkland is probably the most beautiful of any great house in the British Isles. There was the grand 16th century home, standing proud against an almost impossibly beautiful vista of gardens and grounds. We learnt later that Lancelot ‘Capability’ Brown had landscaped these gardens. The sumptuousness of the interior of the house matches the spectacular scenery. 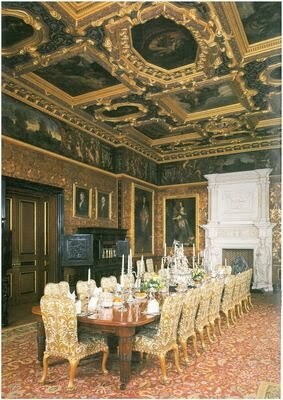 The magnificent tapestries and ornate ceilings provide a perfect setting for the exquisite furnishings, paintings and objects d’ art. We gasped at the grandeur. Fantastic table settings in the State Dining Room. This is seldom used except for entertaining royalty. The first royal guest was Elizabeth 1 and the most recent Elizabeth 11. There is a silver centrepiece that we will never forget. Made by Garrard in 1837 and weighing 1,000 ounces, it took our breath away. On our way out, we passed through the inevitable gift shop. Income has to be generated to sustain these massive estates. We were interested to see a large array of teddy bears, all differently dressed, waiting to be bought. I asked the charming woman operating the shop about these bears. “Oh” she said, “we love our bears.” She then proceeded to tell us about a visitor to Longleat who had driven up in a convertible roadster with a huge teddy bear strapped into the seat next to him. He gently unbuckled his companion and carried him into the gift shop. “Do look after him,” he asked, “ I would hate him to be lonely.” I adore this English eccentricity. We drove away through the parklands, wondering just what sort of person lived in such splendour. It was lunchtime and we spotted a pub as we were leaving the grounds. We stopped and shared a delicious Shepherds pie. It was just out of the oven, superbly flavoured and topped with light and fluffy mashed potatoes. There is such an atmosphere of welcome and warmth in an English country pub. All too soon it was time to leave this cosy sanctuary to continue our journey. We followed all the signs and after a while found ourselves in Glastonbury. Oh dear! All our worst fears were realised. The hotel was indeed a converted monastery. Inside, a very narrow staircase hewn from stone curved steeply upwards. We huffed and puffed up the stairs, dragging our suitcases. The cases scraped and knocked against the walls as we struggled to negotiate the narrow twists and turns. Then the room. It was airless and dark with a small window under the low ceiling. Heavy wooden beams completed the picture of utter gloom. Those monks led a very spartan existence. We tumbled down the stairs as fast as possible. The proprietors appeared to be quite sanguine about the fact that we had rejected their accommodation. They allowed us to use their telephone to phone Graeme. We described our predicament to him. He said he would phone us back within half an hour with a solution. Again, thank heavens for Graeme! The solution was that we should drive onto Bath and stay at the Royal Crescent Hotel. He would telephone ahead and book a room. Over and above the call of duty, what a splendid man. We felt less like strangers in a foreign land. The history and mysticism of Glastonbury would wait as a promise for another visit. 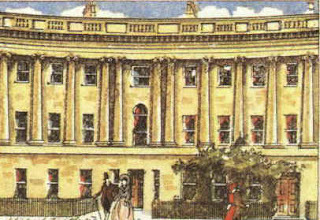 Jane Austen Centre, 40 Gay Street Bath. 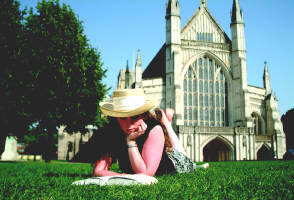 Winchester is one of the country’s best-loved cities. Popular for its shopping streets and architecture, its floral summer season and quirky open air events, England's ancient capital is most well known for its eleventh century cathedral and mysterious Round Table. Home of good food, birthplace of the modern game of cricket, resting place of Jane Austen and inspiration to the many artists who live here, Winchester is a city for all seasons. Come and visit soon. Click here for the 2nd and final part of 'Oh to be in England'.